Figure 6. Catalytic mechanism of caspases. The numbering of the catalytic residues refers to human caspase-1. The enzymatic reaction is represented in five steps (adapted from ref. 49). (A) First, His237 attracts a proton from Cys285 by which the latter becomes more nucleophylic. 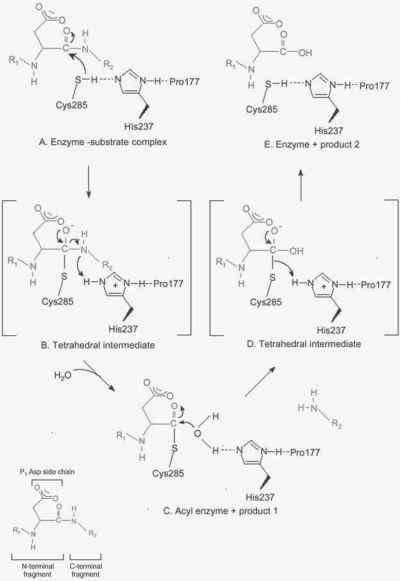 Cys285 then attacks the Pj amide bond of the substrate, inducing the formation of a tetrahedral intermediate in which enzyme and substrate are covalently bound (B). Next, the C-terminal fragment of the substrate (R2, green) is released and an acyl-enzyme complex is formed (C). The oxygen pole of an entering water molecule attacks the acyl-enzyme complex and induces a second tetrahedral intermediate in which the enzyme and N-terminal fragment (R1, red) are covalently bound (D). Finally, electron relocalizations in the tetrahedral intermediate lead to the release of the N-terminal fragment. The enzyme is restored in its initial state (E). The backbone amide of Pro177 may be involved in catalysis, beside His237 and Cys285 (see text). To view color version of the Figure please visit http://www.eurekah.com/chapter.php?chapid=717&bookid=61&catid=69. such as CrmA and p35, which initially act as substrates, is prevention of the entry of the water molecule, allowing them to remain covalently attached to the catalytic cysteine. Finally, electron relocalizations in the tetrahedral intermediate lead to the release of the N-terminal fragment of the substrate and restore the enzyme to its initial state (Fig. 6E). In many proteases a side-chain of a third residue is implicated in the catalysis. The catalytic diad in caspases may be assisted by a third component delivered by the backbone carbonyl of residue 177 (proline in caspase-1, threonine in caspase-3, glycine in caspase-7, arginine in caspase-8) (Fig. 2 and 6). The transition state is stabilized by additional amino acid residues in the binding site that secure proper positioning of the substrate. The binding site of the enzyme is divided into a number of sub-sites (Sx with x counting from the scissile bond in the bound substrate), each securing the corresponding Px amino acid residue in the substrate by multiple interactions. In addition to interactions with specific side-chains, binding of the substrate peptidyl backbone also plays an important role in catalysis. The structures of caspase-1, -3, -7 and -8 reveal that the details of the interactions with different tetrapeptide inhibitors are very similar in the four proteins with the exception of the S4 subsite.48-5 The P1 aspartyl side chain of the co-cristallized inhibitor is involved in ionic interactions with the side-chains of Arg179, Gln283 and Arg341 (numbering in human procaspase-1), which are highly conserved (Table 2). Furthermore, three hydrogen bonds are formed between the conserved residues Ser339 and Arg341 of the enzyme and the inhibitor backbone. 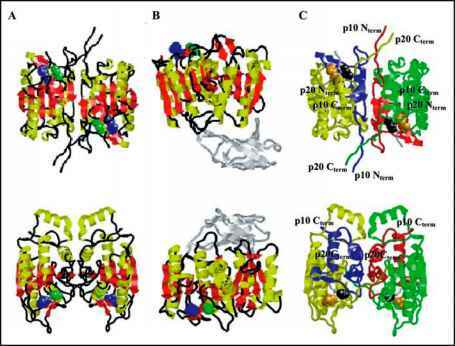 Compared to caspase-1, caspase-3 and -7 possess an extra residue (phenylalanine), which contributes to the binding of the inhibitor in the S2 site. Caspase-8 has a tyrosine (Tyr365) at the same spatial position, but this residue is not involved in hydrogen bonds with the inhibitor. A conserved arginine, Arg341 for caspase-1, in the S3 pocket of the caspases is involved in hydrogen interactions with the P3 backbone.49,53 Interactions at the S4 subsite determine largely the differences in the specificity of the caspases. The residues in the S4 subsite of caspase-1 form a large and shallow hydrophobic depression that easily accommodates a tyrosyl side chain, while the corresponding site in caspase-3 and -7 is a narrow pocket that closely envelops a P4 Asp side chain.5 In caspase-8, the S4 Tyr412 replaces the more bulky S4 tryptophan present in caspase-1, -3 and -7 (Table 2). Due to the spatial organization of the S4 site of caspase-8, it is impossible to form hydrogen bond interactions equivalent to that observed between the Phe250 residue of caspase-3 and the P4 side chain. In addition, a negative charge present in the S4 pocket of caspase-8 is unfavorable for a P4 aspartic acid. Therefore, the caspase-8 S4 pocket is wide but preferentially accommodates aliphatic residues at the P4 position, though other residues are also tolerated. What is diad catalytic mechanism,?